an exhibition at Edsvik Konst och Kultur, in Sollentuna outside of Stockholm. September 1998. 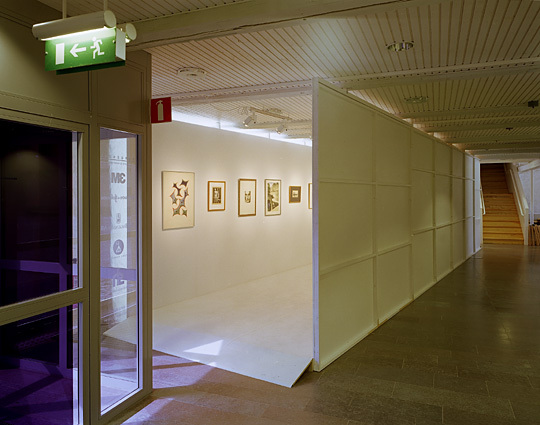 Close to the entrance of the exhibition hall a corridor-like space was built in wood. On the inside the chipboard panels were painted to form a white cube atmosphere, while on the outside the surfaces remained untouched. On the slightly elevated floor a linoleum carpet. On the left hand wall all the Man Ray works were installed in the same order as in the catalogue. Directly opposite them, on the right hand wall, were the dates printed on the wall.